From chimpanzees to dolphins, cats to canines, we now know that animals experience complex emotions. Some common emotions you might see in your pet include anxiety, joy, and what we perceive as shame when they do something they shouldn’t have. But, if you have noticed that your pet is suddenly despondent or just seems off, you may wonder about depression. 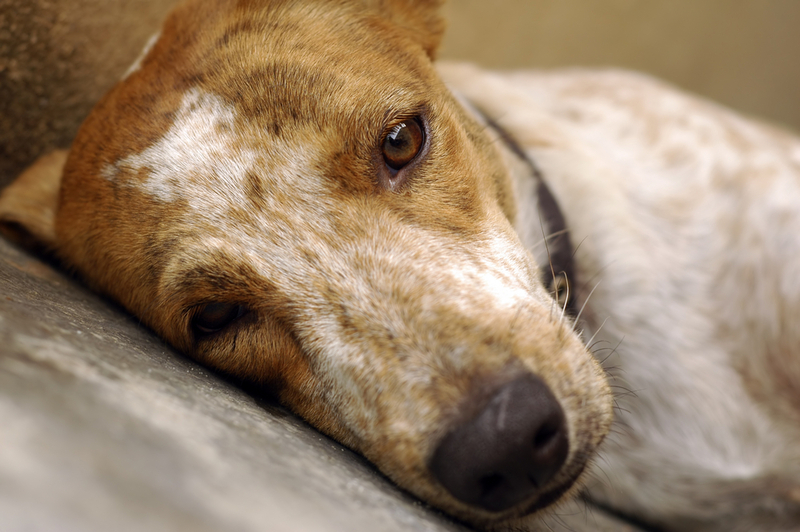 There are a number of reasons why a pet owner will ask us, “Is my dog depressed?” Let’s take a look at some of the causes of canine depression, and what you can do to help your pet. Any one of these signs should be checked out. If your pet receives a clean bill of health, what are some of the other instigators of depression? Here are a few of the more common reasons. Grief – Grief is an emotion that has been seen in whales, elephants, crows, and our domestic pets. If there has been a recent loss in your family, whether of a pet or human loved one, your dog may be picking up on the loss. Dogs also grieve the loss of fellow pets with whom they were bonded. Change – Change is hard for everyone, especially for our pets. Any sort of change can cause mild depression in animals, from the addition of a new family member to home renovation. Boredom – Boredom is a serious problem for our pets because many of us spend long working hours away. Without behavioral enrichment, such as toys, puzzle games, walks, and social interactions, pets can become bored and depressed (often times resulting in destructive behaviors). Work – Certain breeds have been conditioned to perform certain services, such as herding and hunting. If they cannot fulfill their instinctual behaviors, they can become subject to depression, anxiety, and ill health. For most dogs, the key to maintaining excellent mental health is through good training and socialization from an early age, mental stimulation, affection, and time for exercise and snuggles. While not all factors of depression in dogs can be eliminated, there are ways to get your fur friend feeling better. Exercise is an integral need for all animals. Stick to a daily walking schedule or some other form of exercise appropriate for your pooch. Along with exercise, your pet needs your time and attention. In many cases, depression can be linked to lack of attention and activity. Keep meal times, diet, and daily routine as consistent as possible. This is especially true when there have been major changes, such as a move or the addition of a new baby. In most cases, where there is a specific cause, your pet will return to their old self with time. Some issues may not be resolved through time, attention, and exercise, though, so it’s important to work with your veterinarian. Certain medications may be useful, as well as a behavioral consult with OVRS’s veterinary behaviorist, Dr. DePorter. Whenever you are in doubt about physical or mood changes in your pet, the best approach is to consult your veterinarian. Depression in dogs will often run its course with time, but there are situations in which professional help is advised. For more information about depression in dogs, or any other behavioral concerns, please contact us.